After last year’s buyout of the American International Motorcycle Exposition (AIMExpo) from the original owner MarketPlace Events by the Motorcycle Industry Council (MIC), most market watchers assumed that a) the OEMs that form the backbone of MIC would offer ongoing stability for the still young show, and that b) the event would make the jump across Orlando’s International Drive to the more appropriate, and much larger, North Hall, consolidating the outdoor activities while adding a more expansive venue. A month out, AIME dropped the first bombshell, announcing that 2016 would be the last show in Orlando as 2017’s event would hit the road for — the Columbus, Ohio, convention center. Which until now has been best known for hosting Arnold Schwartzeneger’s long-running series of body building championships. That news hadn’t even completed the first lap when it was announced right before Thursday’s show opening that Columbus was a one and done, and that Las Vegas would welcome dealers in 2018 to a Mandalay Bay event, also in October. A few select exhibitors hadn’t even finished their chorus of reliable quotes on why Columbus’ “500-mile radius” was key to attracting dealers in order to grow the event (it isn’t, given Peoples Exhibit A, DealerExpo) when the Vegas jump came out of the blue. If there was any question that MIC’s OEMs were wielding their muscle, this relocation eliminated any doubts. Why this matters involves pure marketing decisions by the show’s owners, and, like every realtor says, it’s about location, location, location. Powersports (read aftermarket) expos have been tried in Vegas before, and they’ve died in Vegas, even during the red-hot 2000s. OEM dealer meetings, on the other hand, thrive in the desert. The move has all the earmarks of a purely strategic decision by Honda, Suzuki, Yamaha, and Kawasaki to consolidate their dealer programs closer to home and away from the proximate distraction of Daytona’s Biketoberfest. I can’t say I’m not disappointed. Orlando remains a major international destination, and both venue and weather remain well suited to the outdoor activities which can’t be offered in a resort hotel facility. Still, H-D was never a participant, and Kawasaki was a big hole in the lineup this year, after drawing plenty of attention with last year’s massive booth. Ducati was another no-show. Ditto BMW. And so it went. This year’s swan song seemed almost a little melancholy, like the guy who came alone to the dance and stayed too late. Compared to the previous decade, many of the booths looked like they traveled as overhead luggage. Warn, Pirelli, S&S, and Avon, among others, didn’t bring the A game of years previous. And speaking of others, Western Powersports, Parts Unlimited, Chrome Specialties, Tucker-Rocky, and Drag Specialties were among the major distributors whose absence, in favor of their own one-off shows for the past several years, severely hurts in the buzz building. 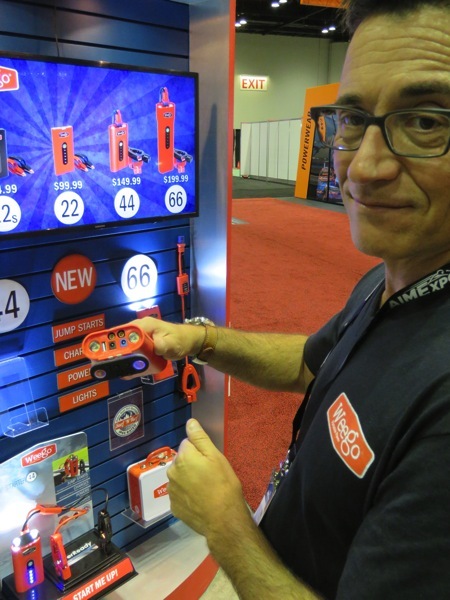 It could be that the appeal of an aftermarket accessories driven trade show has passed its sell by date. Without support from manufacturers, dealers aren’t likely to make the investment in time and money to visit when much of what they’re selling is already on offer at the afore mentioned distributor sponsored shows. And without dealer support, manufacturers can’t be expected to continue their investment without a decent ROI. And this year’s announced dealer registration figure of just over 2,000 falls, to me, far short of fulfilling that expectation. 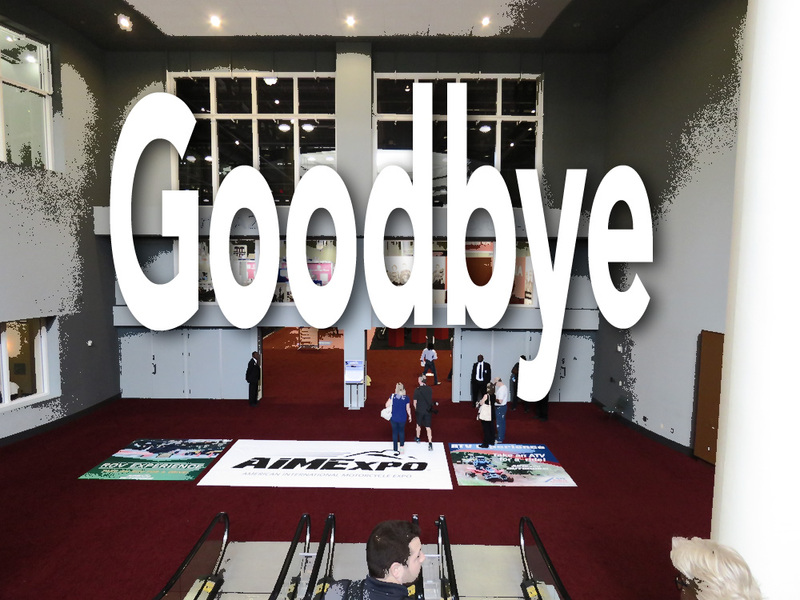 AIMExpo will in the future become a new model year bike show by the major manufacturers with some slots occupied by non-OEMs who either lack a distributor hookup, are doing okay with their own dealer direct and consumer direct programs, or just don’t want one. Nostalgia for the way things were is notable, but unsupportable. Columbus ’17 looks to be the last real expression of the independent powersports aftermarket event. This entry was posted in events, powersports and tagged accessories, aftermarket, Florida, motorcycle on November 20, 2016 by John Siebenthaler. 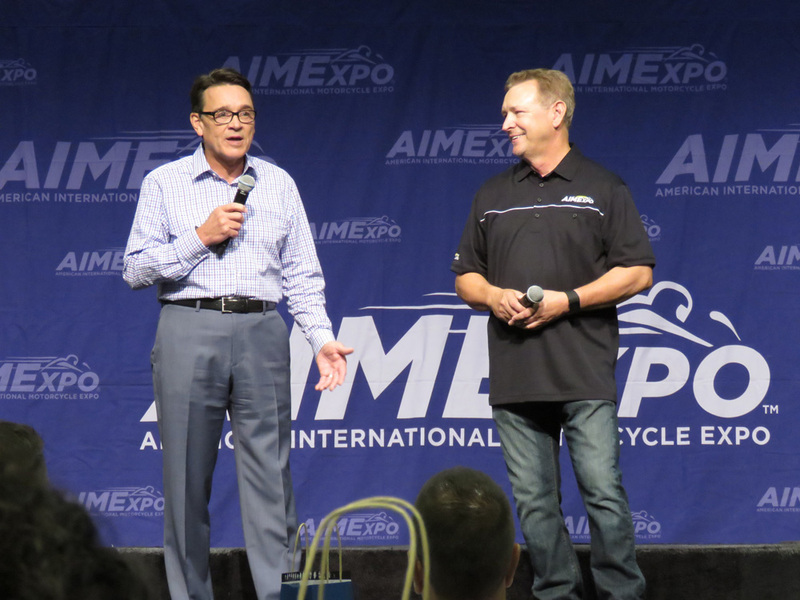 Motorcycle Industry Council members Tim Buche (left) and Larry Little detail MIC’s purchase of AIMExpo event. In just its third year, the American International Motorcycle Expo proved it’s in it to win it, with an exhibitor’s list topping 560, a shortened format making it easier for manufacturers to massage the combined trade plus public components, more OEMs, the revival of the MIA V-twin Made In America® contingent, and another successful round of cross your fingers and hope for yes! the best! weather Central Florida can muster in what we casually refer to as “fall”. 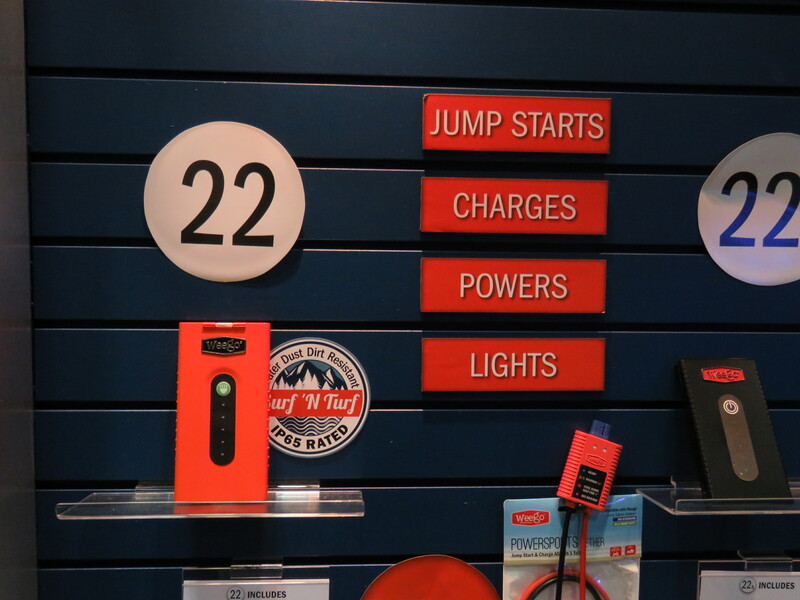 Read more about the powersport industry’s only domestic combined event here, including analysis of format, audience, and the challenges facing retail event marketing in an increasingly online world. This entry was posted in events, marketplace news, powersports and tagged AIMExpo, powersports trade show on November 30, 2015 by John Siebenthaler. Now in its third year, the American International Motorcycle Expo has grown in size, and 2015 saw nearly 600 exhibitors make the trip to Orlando for the four-day combined trade-retail event. Included were motorcycle OEMs, off-road vehicles, personal watercraft, aftermarket manufacturers, apparel retailers, and electric vehicles. For a better visual experience view my images on Flickr. This entry was posted in events, powersports and tagged AIMExpo, event, powersports trade show on November 19, 2015 by John Siebenthaler. 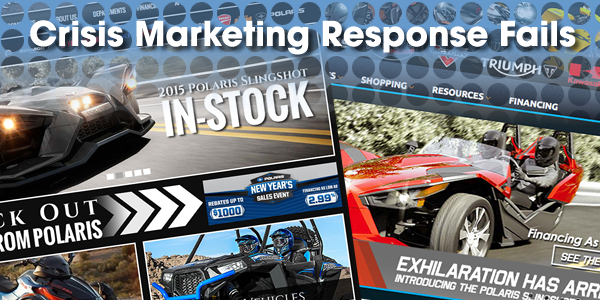 When Dealernews published Polaris’ “DO NOT SELL – DO NOT RIDE” bulletin concerning the Slingshot’s steering mechanism (defective ball bearings) and roll bar assembly to dealers in late January, you’d be correct in thinking dealer print and online promos and ads would be pulled until the situation was resolved. 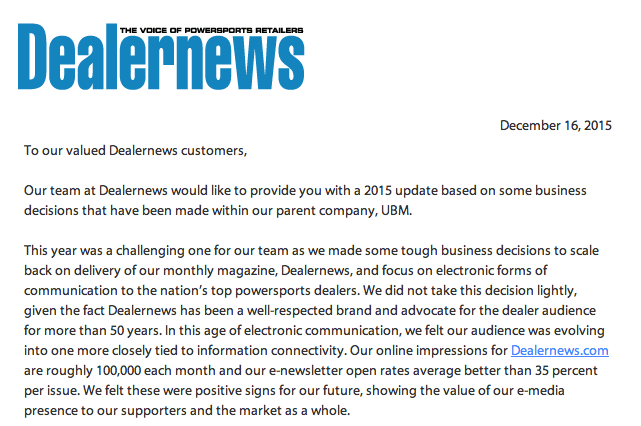 The first public inkling that something was amiss came when the company’s letter to dealers popped up on the brand’s product online forum. That was January 16, less than a year out from the 2014 official public launch and just a few months into production of the reverse sit-in trike designed to take on BRP’s sit-on Spyder. Considering the daily barrage at the time of global and constant publicity concerning GM’s failure to clearly and promptly address their otherwise miniscule ignition switch fatal defect, or the ongoing problems of Japan’s Takata Corporation, supplier of proven lethal airbags to the automotive industry, the approach taken by at least two powersport dealer website management firms to allow Polaris’ fledgling Slingshot to remain in their dealer client’s main banner rotator is puzzling to say the least. 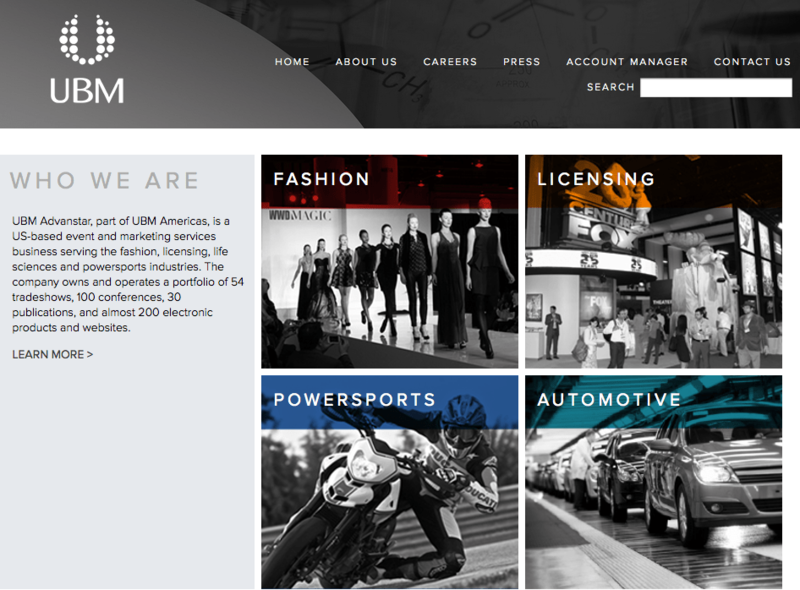 Those dealership content management contractors are well paid on the their promise of providing vigilant oversight, facilitating manufacturer communications, and lightning quick content updates to franchisees usually ill-equipped to oversee the day-to-day front end needs of online marketing. Or not. Taken together with the lack of transparency by the manufacturer, Polaris, and it’s a perfect example of a communications misfire from the top down that’s disappointing at the very least, lending further credence to the industry’s ongoing need for professional communication managers with the knowledge, skill, and authority to manage the occasional crisis. Consumers deserve better for a three-wheeled product that tops out at nearly $30,000. There’s been no further word on the progress of this remarkable dealer notification that affected nearly 2,000 already shipped units, so consumers might assume that repairs to the steering rack and rollbar that began in late January have apparently been completed. This entry was posted in powersports, public relations and tagged content management, crisis pr, marketing on February 27, 2015 by John Siebenthaler. I met legendary powersports media icon Jim Hansen for the first time at Cycle World Trek in 2007. He was easy to meet, easier to talk with, and appeared on this Trek riding one of the first Can-Am Spyders to hit the road. He’d ridden up to Oakhurst, CA, the jumping off point for Trekkers before we headed 130 miles into the Sierra Nevadas for a few days of off-road riding in and around Huntington Lake. Jim swapped his three-wheeler for two and the Spyder was loaded into the event logistics box truck for transport to China Peak. You might think that an invitation only gathering like Trek that collected some of the best known members of the powersports community would be blessed with insight, talent, resourcefulness, and ability. Um, not always. Good news! Fewer than a dozen bikers were needed to unload this ride! It was as if I was watching New Caledonia headhunters seeing their first helicopter. This video demonstrates the combined efforts of Cycle World editors and ad reps, powersports aftermarket manufacturing execs, agency account reps, and industry OEM department heads as they go about solving the ages-old riddle of the Sphinx – what’s the best way to unload a low-slung trike with nothing but a lift gate? Easy! Use a picnic table! Keep in mind, the object in question weighs in the neighborhood of 700 pounds, give-take. Then count heads hovering to and fro like nervous elephant aunts surrounding an expecting new mother, anxiously waiting to welcome a newcomer to the herd. In the brief time I knew Jim, he struck me as affable, curious, and capable. We shared the three-stool counter at Jone’s Store just outside Yosemite over lunch on Day One, exchanging small talk and chit-chat. Although his knowledge of the industry and its people was encyclopedic (and mine is anything but) ours was a comfortable conversation that only later would emerge from the background as a crossroads for me in my association with the industry. Jim was awarded the annual Joe Parkhurst award during that year’s closing ceremony, an insider’s inside honor of respect. He passed away April 11, 2014. I think he’d appreciate the humor he left behind. This entry was posted in powersports on May 11, 2014 by John Siebenthaler.